Lalitha Sahasranamam is dedicated to Mother Goddess Shakti and details the thousand names of Shakti. 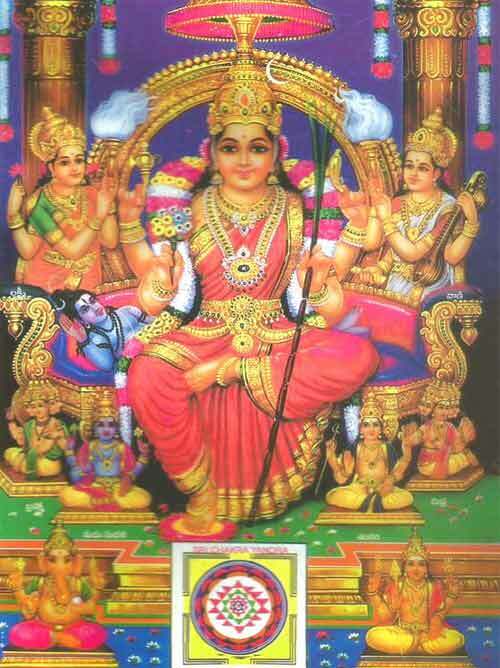 Adi Parashakti Sri Lalita Mahatripurasundari form of Shakti is worshipped in this Sahasranama. This prayer is considered to be the best for householders (Grihasthashram). Poverty and diseases never happens in those homes where Dharma is followed and Lalitha Sahasranamam is chanted. Lalitha Sahasranama is found in the Brahmanda Purana. Each name of Mother Goddess mentioned in the Sahasranamam is pregnant with meaning. They also contain hidden symbolism. Generally stories of various Shakti incarnations, the beauty of goddess and numerous of her qualities are enumerated. The greatness of this Sahasranama is that not a single name of Goddess is repeated. Also there are no unnecessary addition of syllables etc to make the rhyme correct. One will only find pure mantras in it.